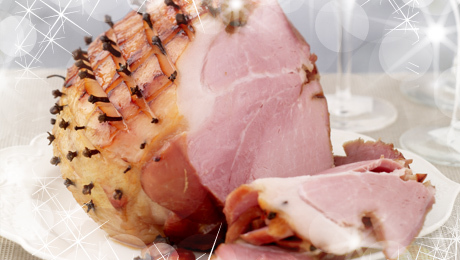 Soak the ham first for up to an hour in cold water. Transfer to a pot, cover with water and bring to the boil. Allow to simmer for about two hours and turn off the heat, allowing the ham to cool for approximately 30 minutes in the boiled water. Remove the ham from the cooking liquor and remove the rind. Score diamond shaped lines into the fat and stud with cloves. Place the Irish Mist in a pan with the honey and cider, then heat gently until dissolved. Place the clove-studded fillet in a roasting tin and brush all over with the Irish Mist glaze, pouring any remainder around the fillet. Bake for 25-30 minutes until completely heated through and well glazed, basting occasionally. Rest the meat for an additional 30 minutes out of the oven before slicing. Carve into slices and serve immediately.